Belmont is situated half-way between San Francisco and San Jose, in San Mateo County, with a population close to 26,000. 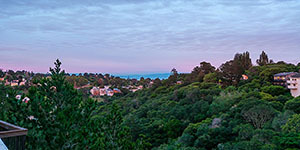 Known for its wooded hills, views of the San Francisco Bay and stretches of open space. A small town ambiance offering many local conveniences! Shoppers and diners will delight in Carlmont Village Shopping Center which has over 45 shops and restaurants including Starbucks, Lunardis, Ace Hardware, CVS and Jamba Juice. Belmont was originally part of Rancho De Las Pulgas for which one of its main roads, the Alameda de las Pulgas, is named. The city was incorporated in 1926. Ralston Hall is a historic landmark built by Bank of California founder, William Chapman Ralston on the campus of Notre Dame de Namur University. It was built around a villa formerly owned by Count Cipriani, an Italian aristocrat. The locally famous "Waterdog Lake" is also located in the foothills and highlands of Belmont. Belmont is a quiet residential community in the midst of the culturally and technologically rich Bay Area.